Hi Osho, thanks for finding a little time in your busy schedule to do this little chat. Could you please start with some words about yourself? When was your first contact with psychedelic trance music, when you attempted your first mixes and when you did finally become a professional DJ? Osho: My first contact to psychedelic Goa trance music, was during the mid 90s. A good friend of mine asked me to join him during some weekend for a Goa underground party. to get to the party we had to follow the instructions that another friend gave us, no flyers, and no phone numbers for full instructions, it was very underground and unique. The DJ on that party was DJ Miko from the legendary California Sunshine. I was fascinated by the music that was played during the party, and the entire experience and this new colorful culture were new to me as well. Since then I started to collect music on CDs, DATs, Vinyls, etc… I was always looking for the right sound for me and over the years it always changed. And I always practice at home on my mixing skills in my bedroom. 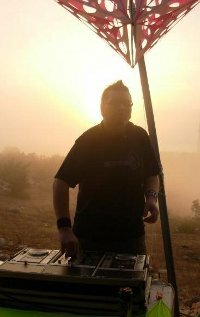 The first opportunity to play a DJ Set was during in 1999 when good friends of mine organized an open air party in the southern desert near our city. A really small one for 200 pepole. This was the begining of a new era for me. Let me ask you about your latest release, the compilation Borderline, but first I feel that I must congratulate you for this outstanding release. I had already read very positive reviews about it, and even with high expectations I was very impressed when I got my copy. How long it took for you to compile it? What was the concept/goal you had in mind? Osho: Thanks for your kind words, I really appreciate it. Borderline took me almost six months of compiling. I knew exactly what kind of compilation I wanted to make, the concept was to focus on psychedelic progressive trance music that will include my favorite artists. Almost every one of the artists on it made a track especially for Borderline, I am very pleased with the result. Right from its astonishing debut, the compilation Think Different, Echoes established itself as a solid label, and since then it’s consistently keeping its high standard. How and why Echoes Records came into existence? Who were behind the project? What was its biggest challenge up to now? 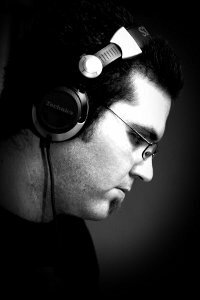 Osho: Myself and Danni Leites (my ex-partner in Echoes) really wanted to create something different, to bring our own vision for progressive trance music, while always keeping it very trendy and fresh. During the year 2007, Danni decided to quit, as he wanted to experience other things, and it was sad for me and I am sure as well for him, as we shared the same vision. This was my biggest challenge! These days I run Echoes along with my new partner Elad Ohana. What Echoes release you think had the most impact in the scene and on Echoes itself? Osho: I think Think Different. It was a really good start for Echoes as the first release, and still until today I always get really cool comments and feedbacks about this compilation. It took us almost Eight months to compile it, choosing the right tracks from the artists we really wanted to include on the CD. What is next on Echoes pipeline? Osho: Khainz- Modul8 (debut album). V/A- Traffic 2- Compiled By DJ Zombi, that will include tracks from top international producers. Easy Riders (debut album) (new project from Ace Ventura & Rocky). 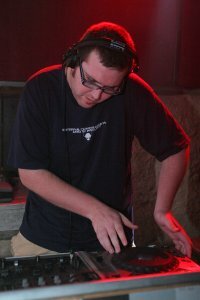 What are the usual suspects in your DJ Sets these days? In your opinion what are the most important characteristics of a good DJ? 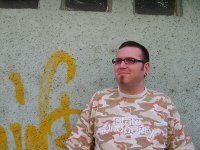 Osho: I think it all comes together, from selecting the right music and the build up of the set, the DJ mixing techniques. And it also has to do with the party itself, sometimes it could be a great set but not really huge vibes during the party from the crowed. In what kind of party you enjoy to perform the most? Besides DJing, what else you usually like to do at a party? Osho: I love to play in a party with great vibes from the dance floors, it doesn't matter to me if there is 300 or 30,000 people on the dance floor, as long as there is massive positive energies. I love going to summer festivals in Europe, get to meet many good old friends from around the world as well as always meeting new people. Osho: Anywhere that will include huge vibes from the dancers on the the foor... 3 hours set. Please give us one track, one producer and one DJ that made an impact on you in 2009 so far and tell us why. It's an outstanding combination of psytrance with major influences from techno, I really love this new style that these two created, and its working very good on the dance floor. The Quantize dou really suprised me with their debut album on Iboga Records, and keep suprising me with every new track coming from them. They bring something new combined with old school and always refreshing. Zombi is one of my favorite DJs, he really knows the job when he's on stage, for those who didn't get to hear him, use the first opportonity you get. What do you think about the changes in the psychedelic scene in the last years? Osho: In the past years everything changed, I guess it's for the best, the psychedelic trance scene was very underground many years ago, and these days in countries such as Mexico, Brazil & Japan the parties are big raves for 5000-30000 people. So its gives an opportunity for more people to get exposed to the music. During the last two years people are not really buying CDs as they were use to and its hurting many great labels we all loved in the past, so many of them are not around any more. Did psychedelic trance music bring positive aspects or influences into your personal life? Osho: Yes, off course. Psychedelic trance music changed my life, the way I think, and of course my influence from different new aspects. Every summer I love to travel, visiting festivals across Europe, getting to meet new and old friends. I guess in some point it has already become a way of living for me. You are an IsraTrance forum member since 2003. Could you please describe your forum experience?